- CHIKARA Tag World Grand Prix '06, Night Two (February 25) = 2.0 (Jagged & Shane Matthews) lost in the opening round of the Tag World Grand Prix Tournament to Men At Work. The Kings of Wrestling won the tournament. - CHIKARA Tag World Grand Prix '06, Night Three (February 26) = In a non-tournament match, 2.0, Larry Sweeney, & The Heartbreak Express fell to Max Boyer, SeXXXy Eddy, Player Uno, & Triple Dragon. - CHIKARA Sand In The Vaseline (April 21, '06) = 2.0 lost to BLK OUT (Eddie Kingston & Sabian). - CHIKARA Aniversario Delta (May 26, '06) = 2.0 competed in a "Tag-Team Gauntlet" Match, which was won by Team Kaientai Dojo (Yoshiaki Yago & Miyawaki). - CHIKARA Aniversario Epsilon (May 27, '06) = Jagged & Max Boyer were beaten by Incoherence. - CHIKARA Return Of The Son Of The International Invasion Of The International Invaders - First Stage (August 19, '06) = Jagged fell to Equinox. - CHIKARA Return Of The Son Of The International Invasion Of The International Invaders - Second Stage (August 20, '06) = Jagged & Los Ice Creams defeated The Professional & The Colony (Fire Ant & Soldier Ant). - CHIKARA Brick (November 17, '06) = Jagged took down Twiggy. - CHIKARA Talent Borrows, Genius Steals (November 18, '06) = Jagged lost to Player Uno. - CHIKARA King of Trios Tournament '07, Night One (February 16) = In a non-tournament match, 2.0 (Jagged & Shane Matthews) fell to Shane Saw. - CHIKARA King of Trios Tournament '07, Night Two (February 17) = 2.0 & Max Boyer lost in the opening round of the King of Trios '07 Tournament to the eventual winners, Mike Quackenbush & ShaneSaw. - CHIKARA King of Trios Tournament '07, Night Three (February 18) = In a non-tournament match, 2.0 competed in a "17-Team Tag-Team Gauntlet" Match, which was won by Up In Smoke. - CHIKARA Best Imitation Of Myself (March 23, '07) = 2.0 defeated BLK OUT (Joker & Sabian). - CHIKARA Showdown In CrisisLand! (July 21, '07) = 2.0 & Shayne Hawke took down Mike Quackenbush & ShaneSaw. - CHIKARA Maximum Overdraft (August 5, '07) = 2.0 was beaten by Los Ice Creams. - CHIKARA Aniversarioma! (May 23, '08) = 2.0 fell to The Osirian Portal. - CHIKARA Tag World Grand Prix '08, Night One (November 8) = 2.0 lost in the first round of the CHIKARA Tag World Grix Prix to Tommy End & Andrew Patterson. The Colony (Fire Ant & Soldier Ant) won the tournament. - CHIKARA Tag World Grand Prix '08, Night Two (November 9) = In a non-tournament match, 2.0 & Karsten Beck were beaten by Kid Fite, Sha Samuels, & Lionheart. - CHIKARA Cibernetico Begins (November 15, '08) = 2.0 lost to The Super Smash Brothers. - CHIKARA Armdrags To Riches (November 16, '08) = 2.0 & Los Ice Creams fell to The Super Smash Brothers & Up In Smoke. - CHIKARA Face With A View (December 12, '08) = 2.0 were beaten by Up In Smoke. - CHIKARA Duel And Duality (December 14, '08) = 2.0 were taken down by The Colony (Fire Ant & Soldier Ant). - CHIKARA Behind The Eight Ball (April 25, '09) = 2.0 defeated Frightmare & Hallowicked. - CHIKARA The Bobliographon (April 26, '09) = 2.0 lost a "Four Way Tag-Team" Match to Up In Smoke. The Super Smash Brothers and The UnStable (Colin Delaney & STIGMA) were the other participants. - CHIKARA Aniversario Yin (May 23, '09) = 2.0 fell to Incoherence (Frightmare & Hallowicked). - CHIKARA Aniversario Yang (May 24, '09) = 2.0 took down The Sea Donsters. - CHIKARA Japan Showcase, Night One (June 12, '09) = 2.0 beat Atsushi Ohashi & Motosugu Shimizu. - CHIKARA Japan Showcase, Night Two (June 13, '09) = 2.0 lost to Ryuichi Kawakami & Yoshihito Sasaki. Later on, 2.0, Chuck Taylor, & The Order of the Neo-Solar Temple (UltraMantis Black & Crossbones) fell to Jake Numazawa, Atsushi Ohasi, & The Colony (Fire Ant, Soldier Ant, & Green Ant). - CHIKARA Young Lions Cup VII, Night One (August 14, '09) = In a non-tournament match, 2.0 were beaten by The Colony (Fire Ant & Soldier Ant). - CHIKARA Man Makes Plans, And God Laughs (September 12, '09) = The Badd Boys (Chad Badd & Brad Badd) defeated The Colony (Fire Ant & Green Ant). - CHIKARA Hiding In Plain Sight (September 13, '09) = 2.0 & The UnStable (Colin Delaney, Vin Gerard, & STIGMA) fell to Colt Cabana, Lince Dorado, Dasher Hatfield, & The Colony (Carpenter Ant & Green Ant). - CHIKARA Throwing Life's Instructions Away (November 21, '09) = The Badd Boys took down Lince Dorado & Helios. 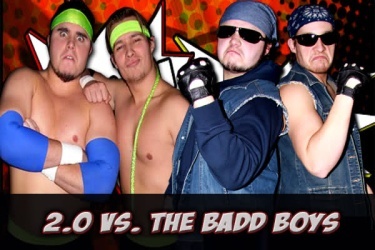 - CHIKARA The Mint Condition (February 27, '10) = The Badd Boys & F.I.S.T. (Gran Akuma & Icarus) fell to Incoherence & The Osirian Portal. - CHIKARA A World Of Comforting Illusions (February 28, '10) = The Badd Boys lost a "Four Way Tag-Team Elimination" Match to Swiss Money Holding. The Osirian Portal and the Super Smash Brothers were the other participants. - CHIKARA Wit, Verve, And A Bit o' Nerve (March 20, '10) = The Badd Boys won a "Loser Leaves Town" Match, via countout, over 2.0. The Badd Boys then 'revealed' that the two teams were the same, renaming themselves 3.0 (Scott "Jagged" Parker & Shane Matthews). - CHIKARA Dead Men Don't Laugh (March 21, '10) = 3.0 defeated The Order of the Neo-Solar Temple (UltraMantis Black & Crossbones). - CHIKARA Aniversario Elf (May 23, '10) = 3.0 lost a "Four Way Tag-Team Elimination" Match to The Future Is Now (Equinox & Helios). F.I.S.T. (Gran Akuma & Chuck Taylor) and The Super Smash Brothers were the other participants. - CHIKARA We Must Eat Michigan's Brains (June 26, '10) = 3.0 & The Future Is Now (Equinox & Helios) took down F.I.S.T. (Chuck Taylor & Icarus) & The UnStable (Vin Gerard & STIGMA). - CHIKARA Faded Scars And Lines (June 27, '10) = 3.0 defeated F.I.S.T. (Chuck Taylor & Icarus). - CHIKARA Young Lions Cup VIII, Night Two (August 28, '10) = In a non-tournament match, 3.0 won over The Super Smash Brothers. - CHIKARA Young Lions Cup VIII, Night Three (August 29, '10) = In a non-tournament match, 3.0 beat The House of Truth (Christian Abel & Josh Raymond). Later on, the team competed in "The Countdown Showdown", which was won by Johnny Gargano. - CHIKARA Eye To Eye (September 18, '10) = 3.0 lost a "Three Falls" Match to the CHIKARA Campeonatos de Parejas Champions, Swiss Money Holding. - CHIKARA Through Savage Progress Cuts The Jungle Line (September 19, '10) = 3.0 & Soldier Ant were beaten by F.I.S.T. (Johnny Gargano, Chuck Taylor, & Icarus). - CHIKARA Scornucopia (November 20, '10) = 3.0 defeated Los Ice Creams. - CHIKARA Caught In A Cauldron Of Hate (February 19, '11) = 3.0 beat The UnStable (Vin Gerard & STIGMA). - CHIKARA Clutch Of Doom (February 20, '11) = 3.0 lost a "Four Way Tag-Team Elimination" Match to The Osirian Portal. Los Ice Creams and The BDK (Daizee Haze & Delirious) were the other participants. - CHIKARA Operation Big Freeze (March 12, '11) = 3.0 & The Throwbacks took down The Roughnecks & The UnStable (Vin Gerard & STIGMA). - CHIKARA Creatures From The Tar Swamp (March 13, '11) = 3.0 fought to a No-Contest with The UnStable (Vin Gerard & STIGMA). - CHIKARA King of Trios '11, Night One (April 15) = �3.0l�! (3.0 & El Generico) lost in the opening round of the King of Trios '11 Tournament to The Osirian Portal (Amasis, Hieracon, & Ophidian). The Colony (Fire Ant, Green Ant, & Soldier Ant) won the tournament. - CHIKARA King of Trios '11, Night Three (April 17) = In a non-tournament match, 3.0 competed in a "Tag-Team Gauntlet" Match, which was won by Daisuke Harada & Atsushi Kotoge. - CHIKARA Aniversario & His Amazing Friends (May 21, '11) = 3.0 defeated The UnStable (Vin Gerard & STIGMA). - CHIKARA Aniversario: The Legendary Super Powers Show (May 22, '11) = 3.0 fell to Swiss Money Holding. - CHIKARA Chikarasaurus Rex: King Of Sequel - Night One (July 30, '11) = �3.0l�! (3.0 & El Generico) took down F.I.S.T. (Johnny Gargano, Chuck Taylor, & Icarus). - CHIKARA Chikarasaurus Rex: King Of Sequel - Night Two (July 31, '11) = �3.0l�! were beaten by The Spectral Envoy (UltraMantis Black, Frightmare, & Hallowicked). - CHIKARA Maiden Flight Of The Great Condor (October 30, '11) = 3.0 lost a "Four Way Tag-Team Elimination" Match to The Colony (Fire Ant & Soldier Ant). The Batiri (Kobald & Obariyon) and The Roughnecks were the other participants. - CHIKARA Cibernetico: The Animated Series (November 12, '11) = 3.0 defeated The Bravado Brothers. - CHIKARA The Thirteenth Hat (January 28, '12) = 3.0 won over The BDK (Tim Donst & Jakob Hammermeier). - CHIKARA A Death Worse Than Fate (February 25, '12) = 3.0, Greg Iron, & Eddie Kingston fell to The Batiri (Kobald & Obariyon) & The BDK (Tim Donst & Jakob Hammermeier). - CHIKARA Caught In The Spider's Den (February 26, '12) = 3.0 beat The Throwbacks (Mark Angelosetti & Dasher Hatfield). - CHIKARA Green Ice (March 24, '12) = 3.0 won the CHIKARA Campeonatos de Parejas Titles, winning a "Three Falls" Match over F.I.S.T. (Chuck Taylor & Icarus). - CHIKARA It's How You Play The Game (March 25, '12) = �3.0l�! defeated The Batiri (Kobald, Kodama, & Obariyon). - CHIKARA Hot Off The Griddle (April 28, '12) = 3.0 & The Spectral Envoy beat The BDK (Tim Donst & Jakob Hammermeier) & The Bravado Brothers. - CHIKARA The Contaminated Cowl (April 29, '12) = 3.0 lost the CHIKARA Campeonatos de Parejas Titles, losing a "Three Falls" Match to F.I.S.T. (Johnny Gargano & Chuck Taylor). - RoH Killer Instinct (October 6, '12) = 3.0 fell to The Bravado Brothers.